The fundamentals of microwave and wireless communications technology are critical to the telecommunications and data acquisitions fields. Because many of the new developments involve commonly available equipment such as cellular telephones and satellite dishes, technicians as well as engineers must learn the basics of the technology. 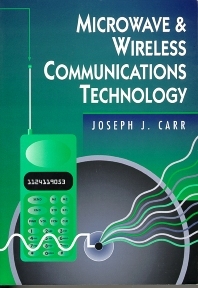 Microwave and Wireless Communications Technology offers a practical, device-based approach to the study of microwave and wireless communications. Student objectives, numerous questions and problems, and end-of-chapter summaries reinforce the theory in each chapter. Answers to odd-numbered questions are provided in the back of the book. Math is kept to the lowest practical level, and the last section of each chapter is a collection of the key equations laid out for the student. A Windows diskette with supplementary instructor material is available on request with adoption.